A garden can enrich our lives in many ways. But it can be especially rewarding with a harvest. Now, I’m not just talking about a harvest of fruits or vegetables. All harvests can be exciting – even flowers, seeds, pods and roots. The trick is knowing what to do with those harvests! 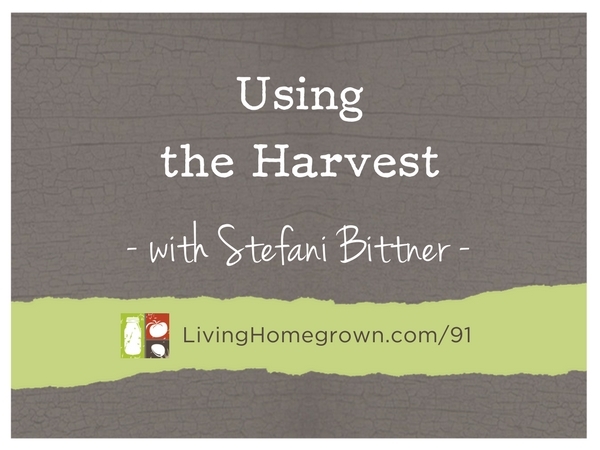 This week, I brought back garden designer extraordinaire Stefani Bittner to talk about her new book, Harvest that she co-wrote with Alethea Harmapolis. It was just released by Ten Speed Press and it’s gorgeous. The book is filled with step-by-step projects that use unexpected and common garden plants. From cocktails to flower arrangements, it shows you how to better enjoy your garden. All the details on how to enter to win are below. During the interview, Stefani and I had a whole discussion about quince and all the amazing things you can do with it. You see, quince is one of those fruits that is either unknown or very under appreciated by people. But in canning, Quince is a rock star! Below, Stefani shared her delicious recipe for making quince paste (aka membrillo) which is like a firm jelly served as a dessert or appetizer. It’s amazing! Stefani is the owner of Homestead Design Collective, a San Francisco Bay Area landscape design firm focused on creating beautiful gardens that provide harvest. Her team offers a unique and sophisticated approach, using both organic farming and fine gardening skills, for people who want help creating aesthetically designed, organic edible gardens. 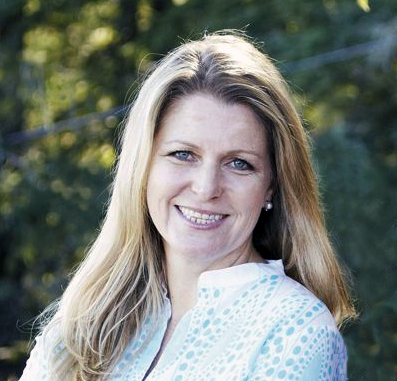 Stefani is the co-author of The Beautiful Edible Garden and her newest book, Harvest. Homestead provides design, installation, and full-service organic maintenance, harvesting, beekeeping, floristry and composting services. One of the coolest projects Stefani has completed recently is the design and install of new test garden for Sunset Magazine. You can get a sneak peak on the Sunset website (link below). Don’t know about quince? No problem. We talk about quince in the podcast (and transcript). And then Stefani agreed to share her recipe for making quince paste (membrillo) below. Quince paste is like a really firm jelly with amazing flavor. It is usually served as a slice or a spread and can work as an appetizer or a dessert. Just click below to download the printable recipe. Creating an Epic Landscape – Stefani appeared on episode 75, where we discuss how to use edibles to create a beautiful garden. 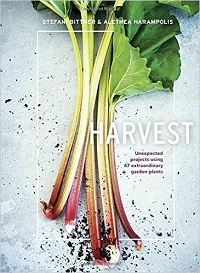 Unfortunately, the time as passed for you to enter to win a copy of Stefani’s new book Harvest. Our winners are Nancy Tidd and Jacqui Geiselman. Congrats! But…You are welcome to still leave a comment below! I love reading everyone’s input on productive plants. We are contacting the winners and will post their names after we get confirmation. What’s your favorite useful garden plant? Or what useful plant have you always wanted grow? Or what edible do you want to learn about next? To win, the comment had to be posted BEFORE 6 pm (PST) Thursday, March 16th. You must live within the continental United States to enter. So…What’s YOUR favorite useful plant?? I would love to grow elderberries in my yard. So nutritious! Have not tried horseradish and I love it for cocktail sauce and adding to beef in the crock pot. I ordered a root to try this year. Never thought of this! Love this idea too! My fave most useful and versatile plant I grow is mint. I use it for tea and balms and more. The plant I would like to grow is peaches…my kids love them. Unfortunately were in a zone that won’t allow them to thrive. I would love to successfully grow and harvest figs! I picked my first few gigs last year, and am hoping for more this year. I’ve recently fallen in love with Bee Balm, it’s beautiful and brightly colored blossoms last so long! I love that it has a multitude of medicinal purposes, as well as makes a lovely tea. The blossoms attract bees and hummingbirds alike, which is so exciting to watch! For this year, we’ll be giving louffa sponges another go. I grew them years ago, but had a short summer and only harvested on sponge! I started the seeds early this year, so I’m hoping for a good harvest! I love the sponges in my homemade soaps, as well as in the shower or cleaning around the house! I love cilantro! It’s so versatile! You can eat the leaves and stems. But also the green seed pods are delicious. Then when the pods dry up save them and grind them up as coriander! Awesome plant. What do I want to grow this year? Borage! I have read they are great for bees, have lovely, edible flowers, and are good companion plants for many vegetables. Last year was my first year for a garden, and by the time I got going, all of the borage at the garden stores was gone. This year, I ordered seeds! Thanks for the great podcast, Teresa! I love fresh figs. They are rich in potassium, high in fiber, and a delicious sweet addition to salads and fruit dishes. Unfortunately, it’s almost impossible to find them where I live. After a lot of reading and research, I’ve planted 4 small fig trees in containers. I hope they grow and produce wonderful fresh figs for many years. My husband and I will be planting our first fruit trees soon, and I will be growing pumpkins and melons on a fence this year. My favorite useful plant is garlic. I grow enough to replant, and I make medicinal tinctures, besides using in cooking. The bulbs also make great Xmas presents. I would love to grow comfrey because of its abundant healing qualities; both the leaves and the root. It also is a wonderful fertilizer for the garden. Star Annice, Illicium verum, is the plant I want to grow. I have some seeds and have scarified them, then soaked for 24 hours in luke warm water to break the dormancy. They are now in a container in the greenhouse. Fingers crossed, one or two might germinate…… time will tell. My blueberry bushes are the best. They provide for so many – us, our bees, and other wildlife. They not only give me fruit that is good for my health, but I can make jams, jellies, and syrup. They pair well with other fruits. They also look great in the landscape – blooming in the spring and are great for our bees, and beautiful red foliage for fall. the berries that fall on the ground provide food for small critters and they presence in turn provide food for the fox that lives on our property. I love peonies (trying to grow, no flowers yet). I’d love to try camellia. I enjoy growing Red Shiso in my kitchen garden plant area by my back door. Zone 4 here. I love the flavor boost it give my salads. ( kind of spicy and and sweet ) It makes a lovely pot plant that I leave in the pot all winter, because the birds like to eat the seed. Multi-functional plant for sure. I am a coffee addict and have just been reading about an Arabica coffee plant. It would definitely be a houseplant in my area, but thought it would be great fun to try. I want to grow peas which I understand have to be planted by St. Patrick’s Day! Depends on where you live. In zone 9b in S. Calif, I plant mid Oct to mid Nov AND again mid Jan to mid Feb. It’s my cool season crop. The seeds like to sprout in warmer soil, but once going they withstand light frosts. Yes, we get warm spells in the Winter, and I plant then. SJ is correct, I’m in 5b (CO) and they say not to plant anything before Mother’s Day – BUT I planted my peas last year the first weekend in March and had a great harvest, even with 3-4 more snow storms. I was nervous, but went for it. Planted mine this past weekend. A few years ago, my daughter encouraged me to grow lavender on our small farm. We planted 500 plants, and after 3 years, had a bountiful harvest. With all that lavender, we went in search of recipes, and discovered many wonderful ideas. We’ve left the farm, but learned to take chances with new plants. I’m planning to grow Birdhouse Gourds this year to make a few birdhouses for my fine-feathered friends. The plan is to have the birds around for insect control in the veggie garden. Wish Me Luck!!! Hi Theresa, I’m in Zone 7 and my true plan is to grown enough vegetables and fruits each season to last throughout the winter. My problem is that my house is small without a basement and without a garage. I don’t plant very much because I don’t know enough about storing my harvest without having a root cellar. Any suggestions, Theresa? Anyone? Thanks! Use the space under my stairs . A small greenhouse attached to or independent of your house. They are very reasonable these days or better yet make your own. I’m, also, Italian, so let’s start there ! I LOVE, LOVE, LOVE Oregano and Basil ! I, obviously, use it in my cooking but I also use it when making dog food and treats ! It’s a Great Antioxidant for all of us ! I would love to learn more about eggplant. My BIL says tha plants are beautiful, so I decided to try growing them for the first time this year. My favorite plants to raise in the garden are green beans and peas, love both equally. They are both able to be used in many dishes as well as by themselves. Love the edible pod peas but also love peas right out of the pod, just a true piece of Heaven right out of my gardens. Their blooms bring the Bee friends to the gardens too which is a delight to see. I would love to grow asparagus!!! A perennial vegetable in MT is a real treat!!! One of the same reasons rhubarb is so popular in this area. I’m hoping to add a few blueberry plants this year. Looking forward to using the berries for many things! I love growing roselle! So fun and pretty and makes a great tea! My favorite useful plant is comfrey. I think it’s not as well known as some others used for medicinal purposes. I can remember my dad going into the garden and harvesting leaves from a massive plant he kept. He would crush them with a pestle and mortar and apply it directly to the skin and wrap it with plastic wrap to help with our sprains and bruises and other sports injuries, and I often saw him use it on my grandparents’ joints to ease arthritis pain. It also makes a great fertilizer in the garden! I used pears from my sons tree but after a storm tore it down, I planted a tree in my yard. The first year no blossoms. Last year a late frost left me with 2 pears which the deer ate. This year that branch is trimmed and the fence is taller. Looking forward to pear buttoned this year. I’d like to learn recipes for cooking with Aronia/chokecherry. We at adding several to our food forest and hope to do more with them than just feed our chickens. Thanks! More edible flowers and chervil!! Teresa, I already answered above so this is just a request – not trying to get two entries in! Sometime, I wondered if you might do an episode on making homemade tomato paste. Thanks! so impossible to choose! a favourite last year was alpine strawberries because my 1.5 year old loves picking them and eating them herself. love both the white and red. I’ve also been wanting to find a home for some evergreen huckleberries so it was nice to hear about that on the podcast! A favourite useful plant in my zone 7b garden is purple sweet potatoes – vines can be clipped in the summer to use in omelet, stir fries, soups etc; beautiful flowers in late summer look like morning glories; and the sweet potatoes harvested in late summer or early fall are absolutely delicious & store well once you cure them. I love edible flowers! I grow borage, nasturtiums, calendula as well as harvest wildcraft flowers of rose, violet, dandelion, goldenrod to add to homemade soaps, scrubs, and infuse in oils for massage. Plants are some of my best friends and My biggest love. I have a patch of wild black, they are small yet quit sweet. I have a short week to pick and can them. I live in the suburbs. Kids in the neighbor would jump my fence as well as stray cats. Well now that they have grown, useful protection. Plus birds of all types. Very useful plant. Mint is used in cooking, baking, spa projects, kombucha flavoring and tea in our house. I would love to grow rhubarb because it is able to be used so versatily in sweet and savory dishes. I always have chives and mint planted either in my garden or in a pot on my porch for the mint. Mint tends to run wild if I plant it in the yard. I use it for toppings and garnish in the kitchen all the time. We planted witchhazel last year – can’t wait to make my own astringent! Looking into growing quince, hopefully will work in my zone. My favorite is plant right now is Basil. We have an over-abundance right now, so yesterday I learned how to dry it in the microwave. It was really quite easy once I learned not to improvise on the instructions (and put out the fire I started in the microwave lol). I’m so excited to never have to buy dry basil again! In the past the only things I have really grown in my urban yard are tomatoes, cucumbers, and peppers, and a few herbs. This year I am spreading my wings and growing additional vegetables–kohlrabi and eggplant among others. And adding to my herb garden. In addition, I want to add a witch hazel bush to my yard so I can make an astringent infusion. The plant also has beautiful and unusual flowers that will look great in our fall and winter landscape. Hard to pick only one favorite love my Arp rosemary bushes they live thru winter grow 5’by5′ and smell wonderful. Love blueberries and strawberries. Whole front yard herb garden back yard veggie garden. I actually snuck in some purslane in a salad for the family, and they ate it! It grows like a weed here, and since we don’t spray our yard, I don’t mind using edible “weeds”. I had pickled purslane once, and it was quite tasty. We make Pesto out of our driveway decoration purslane, bright and lemony! We love peppers, sweet and hot! They add flavor to food and open stuffy noses. =) I’d like to grow garlic. I use it in almost all my dishes. I love having many kinds of berries in our yard but would have to say my favorite useful plant in our garden is parsley. It adds a lot of color and flavor as a garnish and also makes a delicious pesto. I have a great garden each year but I’ve yet to try asparagus or brussel sprouts. I hope this is the year!!! My favorite “plants” are the native fruit trees we planted about 5-6 years ago. We have enough to get loads of plum, chokecherry, choke berry, service berry, and other juices – mostly for jellies. I’d like to know other uses for these (I’m not a wine-maker). My most unusual (for me) plant for jelly is the Staghorn Sumac – makes a delicious jelly, and the berries can be used as a spice! Who knew? I’ve heard you can make a salad from dandelions. I’d love to learn more about this and other things that I have no idea about. Thanks for sharing this stuff with us. I am now sold on microgreens, grow both inside in the winter and outside all year long. I want to grow figs. I love the fruit and would love to try making and canning jelly from digs. My favorite flowers are nasturtiums and calendula. I put them in salads and decorate appetizers with them. Also calendula is good for making salve. My favorite food plant is sugar snap peas, so tasty! I am trying to include more fruit trees, son I just planted a dwarf plum and nectarine. Wish me luck! I love old roses. Most smell heavenly and both the petals and hips are edible. I even clipped a recipe out of a magazine years ago for making rose petal beads. I think oregano is amazing! Grows quickly and easily as a great ground cover. I use it in cooking and to make a tea that calms a cough. I want to add that you should not use store-bought roses. Commercially grown roses are likely to contain pesticides. I would like to try growing flax seed. I use it so much it just makes sense to grow my own. The most surprising oddball of the garden also has the best use for organic households. It is the Osage Orange from the Osage or ‘Hedge Apple’ tree. (Maclura pomifera) If you tuck it in a closet, it keeps bugs away. Particularly cockroaches! Even though its name sounds tropical, the hardy tree grows from Texas to here in New England. It is a funny looking bubbly round green fruit. I want to grow comfrey for both soul benefits and chop and drop mulch. Hard to pick one but guess it would have to be tomatoes. I freeze and can enough for everything from soups and sauces to use all winter. For me greens are the most versatile (chard, kale, collards, asian greens). They don’t take alot of space, they are easy to grow. You can eat them raw in the spring when they are small and then they carry through from smoothies to an additional to many meals through the rest of the growing season. I need ideas for jerusalem artichokes. They are a pretty plant, but I have not made anything from the tubers yet that I really like. I love to include nasturtiums in my garden. They’re leaves are edible. The seed pods can be pickled. Myself, I enjoy nibbling on a few flowers as I garden. I’m amazed that the different colors of flowers have subtle taste differences. I love growing herbs and blueberries. They are great to use in home cooking and look and smell so wonderful in the garden. I would love to grow asparagus and artichokes. The vegetable is a benefit but the plants look fabulous too as they grow. I love nasturtiums. They are super easy to grow and will often set seed. The flowers and leaves are both edible and have a brilliant peppery taste. They are a good companion plant in the vegetable garden as well. Although I don’t plan on eating it, I’m going to try growing bamboo this year! It will be useful while growing as a privacy screen, and the canes will be very useful around the garden once harvested! I’m super excited! I love the versatility of mint. Can’t get enough of it! Loved this episode!! My favorite useful garden plant is lavender. Smells great, soothing when I have a headache and will be my first choice when I learn to make lotions. I like to grow calendula, as it it provides pollen for our bees and I use the flowers to make healing oils and salves. As an avid gardener and home canner, I’ve mainly grown the staples of tomatoes, peppers, green beans, etc., but last summer I joined a CSA and experiences microgreens for the first time. Oh my goodness! I had the best salads of my life, with just a simple vinaigrette dressing. I’m so anxious to try other gems from the garden! My favorite is ground cherries. Plant them once and they keep reseeding providing a bountiful harvest for salsas, tortes, clafoutis, jams, jellies, pizzas…. need I go on? I am very much looking forward to growing (and using) Echinacea this year! My favorite useful plant in the garden is basil. It’s so expensive to get store bought, fairly easy to grow, and absolutely delicious in everything from drinks to meats! I am passionate about herbs and my favorite is LEMON VERBENA. delicate Lemon flavor from the Leaves to be used as Hot Tea, Cold Tea, pound cakes, scones and may other uses that can replace the Lemon flavor. If you have never heard of or used this plant, find it and give it a try. You will be surprised and it just may become one of your favorites. Would love to grow blueberries! My favorite useful plant in the garden has to be rosemary. It is one of the first things I’ve ever grown and it is really easy to maintain! I am trying my hand at growing blueberries from seed this year, still waiting for them to germinate! Patience is something I’m still learning when it comes to the garden ? I like to put the pruned bows of my bay leaf in the back of my pantry shelves to help keep pantry moths way. Be bows dry and stay together well and don’t make a mess like I imagined they might. I love to grow chocolate mint and use the leaves for tea that smells like Girl Scout cookies! Wax Myrtle ,a moist soil bush, growing in the Southeast U.S can be used as a hedge around the house and the trimmed boughs used in dog runs, chicken coops and other animal/human enclosures/housing to repel fleas and insects, including mites, ticks, and other pests. Passed on to the European settlers by the Creek(Muscogee) Indians. Lavender is one of my favorite flowers to grow – it reminds me of my grandma and is soothing to my soul. I’d like to add more textures and scents to our garden and landscaping this year and would like to try lemon balm, lavendar, and oregano as edible landscaping to the front of our house this year. Here in Cape May County New Jersey we are prime beach plum territory. My brother made Beach plum jam which was an awakening to me. I thought they were pretty shrubs but now I saw their greater value & my one tree is struggling to get enough sun. Hello Homegrown community! First loved this show so many ideas brewing, second love this podcast for the same reason. The most useful plant I have found has been the YUMMY Orach, we call it mountain spinach here in the CO. I love eating it raw in my salads, adds great texture and flavor, I love blanching it like spinach and because of its flavor you don’t need to add much else to it, and I plant a TON so I blanch and freeze it and use it in my green smoothies – I just ran out so I am so eager for planting season!!! Also, its so pretty, I plant it in my bee garden too, the pink/purple foliage is just so so pretty and bees love the flowers, and birds love the seeds. Also its a great self seeder. for the bee garden its great, and if you don’t pick fast in the veggie garden you get surprises the next year :). LOVE IT! We planted elderberries last year. They are doing well and I’m really hoping for a good harvest. Nuts! Both hazel and chestnuts. Hazelnuts for nut butters (or raw eating) and chestnuts for finishing out our pigs at the end of the season. Storage is a breeze, and the natural oils and protein are incomparable! Being perennials, their the gift that keeps on giving! Calendula is my most useful plant because it is beautiful, it is a pollinator plant, it is edible and it is medicinal. Great podcast, as always! I love learning from you and look forward to my weekly listen. My most useful plant is Lavender. I love it for edibles as well as scents in bath products. I think I would like to try dill next. Can you believe I never have? I will be planting a few lavender plants this year. I want to make lavender bottles, sleep pillows, cleansing cream, furniture cream polish, lavender oil, tea, water, lotion, crystallize the leaves, and so much more not to mention using the flowers in fresh and dried arrangements. It is a super versatile plant and one of my favorites! We enjoyed hearing Stefani talk about Elderberry. We have 2 year old plants and are hoping that eventually we’ll be harvesting some nice, plump berries. I’m planning for edible flowers. With both sweet and peppery varieties, endless colorful possibilities await my kitchen! I have gained a recent awakening about and appreciation for certain trees that I have previously overlooked or maligned on my 2.5 acres. I, and my bees, have harvested, or will harvest, nectar into honey, nuts into fudge, berries into candles, and sap into syrup from my old and massive or volunteer hickory, maple, tulip poplar, and wax myrtle trees. I cannot take credit for planting them up to 160 years ago, but I learn something new about them almost every day. Thanks for your podcasts and resources. I love using my old roses. I just started drinking tea, and am looking forward to making rose hip tea this year. Dandelions. We make wine, coffee, salad, jelly and salve from this wonderful plant. My favorite plant is lavender. It can be used for cooking, cleaning products, lotions, decorations, and (most importantly) it brightens my mood. I love the smell of lavender and every time I am in a bad mood, I rub my hand through it or cut a sprig and carry it and my worries fall away. My favorite useful plant is rhubarb..I use it for more than just pie. My most useful plant is the tomato. I use the tomatoes to create different sauces (meat and meatless) and salsas which I can. I also can them whole, diced, and as puree and juice. I use my canned tomatoes in my homemade soups as well as entrees. Tomatoes are the base for my vegetable juice which I then use to make my famous bloody mary mix. I dehydrate the skins and make tomato powder which can be rehydrated to make paste, sauce, ketchup, pizza sauce, and juice. The tomato is a very versatile plant! I want to plant garlic. As an Italian family, we eat a lot of garlic. I currently purchase bags of garlic and dehydrate it to make garlic chips, which in addition to rehydrating and using in a pinch (long shelf life) can also be used to make garlic powder and garlic salt… I make garlic mojo and always have it on hand in the fridge. The health benefits of garlic are numerous. Learning how to grow, harvest and preserve my own garlic is the next item on my home preservation to-do list. Oh how can I choose just one plant! We are starting over so I suppose for now it will be apple trees and elderberry trees! We love out apple here and I love Elderberry syrup. By far garlic is my favorite!! I’m a bit obsessed about growing garlic! I’d love to learn more about it (can never know too much about it). Growing elderberries is intriguing as well! I love arugula but would like to grow borage & asparagus!! I would love to grow wasabi, as my husband is addicted to it. We usually think of eating just the root, but I’ve read the stems, leaves and flowers are all edible. There’s nothing better than a plant that can be used completely. Plus buying real wasabi is very difficult and expensive. I love Aloe Vera! I bought a plant last year and I’m having a little trouble keeping it alive. A few months ago, I burnt my hand very badly and used the gel from the plant to sooth my burn. It kept it from getting any blisters or even showing much sign of a burn at all. I’d be interested to learn other ways that I can use this amazing plant as well and better ways to keep it alive. I love growing herbs, especially basil. I grow several varieties and use them in my cooking plus make pesto and freeze for later. We love fresh pesto on pasta and pizza. My favorite garden plants are perennial herbs like sage and rosemary. I started gardening last year, and I am really looking forward to the asparagus. I also enjoyed adding Nostersium to my salads. Beautiful and delicious! Our favorite plant is Blueberries. They supply us with fresh berries from May until October! We have 17 plants with several different varieties among them. Best investment we could have made! I am interested in growing huckleberries, so this podcast timing was perfect. Last year at our local farm market I purchased pineapple quince out of curiosity. I cooked the quince, then combined it with gala apples from my yard to make a marvelous apple butter. The farmer promised me he would have it again this year, so I plan on making my new apple butter again this year! I love adding sunflowers on the north side of my garden. I can still plant other edibles underneath them and my chickens appreciate the shade they cast! Dandelions. They are everywhere and my chickens especially love them. It is very hard to select just one useful plant in the garden for a beginner gardener, such as myself or a seasoned gardener. Most of the plants in our gardens we find useful in one way or another. I live in an area of SC where many of my neighbors and friends have never tasted the wonderful flavors that herbs can infuse in food. I love just about all herbs but my favorites are Cuban oregano, pineapple sage, rosemary and basil (napoletano, lemon, lime, and Thai). When I use these herbs in cooking and share a meal with my friends they are amazed that the meal is so flavorful and with very little salt (Himalayan salt) they want to learn how they can grow herbs and cook with herbs too and thus make healthier choices. If I can help a few of my neighbors and friends along the way of my journey of living home grown and healthier then the plants in my herb garden in my opinion are useful plants indeed! I’m a beginning gardener. Actually, I’ve been gardening for close to 5 years, but I can’t get the hang of it. I still have a high failure rate every year… but I keep plugging away, learning new things every year. I’d really like to be able to grow herbs and learn how to use them in every day cooking. I’ve tried growing herbs 2 times and they failed both times. I am bound and determined to get it right, one of these years. Any and all basil & mint. My climate is very hot and dry in the summer, so these plants grow so well. I start just a few different varieties, once they are big enough clip a few stems, place in water, watch the roots grow then put back in a pot(mint goes in a pot, defiantly) or raised garden bed. Not only do they taste great in salads, drinks and teas, they are versatile in almost everything I cook. The flowers are amazing in any vase on my counter or window sill, plus the bees go crazy for them. I can’t wait for summer so I can start again! New to gardening, and I think I’d like to plant some elderberry’s to keep the deer out if possible!!! Perfect..Great interview! Now I want to add elderberries, have lots of wild huckleberries but feel like I should close my eyes and spin three times and just pick one…but that would just make me dizzy. A favorite is mint, I use it mostly for floral arrangements. Would love to do edible flowers. Thanks so much! It is a tie between lavender and mint, I love them both so much and they both grow well here in Colorado!